Tradition has it that King Alfonso I 'The Catholic' constructed this building on 21 February 746, and the excavations carried out at the start of the refurbishing work to turn it into a Parador de Turismo confirm this idea. 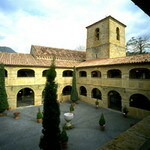 The current monastery was founded on this site and run by the Order of San Benito until the Desamortización de 1835 and was declared a National Monument in 1907: truly a jewel set on the green banks of the River Sella, in whose waters the hotel is reflected. This Parador, featuring comfortable and modern facilities, is the ideal starting point from which to discover the delights of the Asturian landscape, enjoy its typical festivals and ancestral folklore activities and sample the best and most authentic of its rich gastronomic tradition. The Parador occupies hundred-year-old mill, located in the Isabel La Católica Park, one of the most beautiful spots in the town of Gijón. 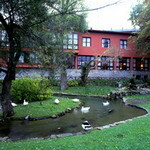 It has a beautiful pond, which offers great harmony and tranquility. The closeness of San Lorenzo beach and of the Cimadevilla sailors' quarter, convert it into an ideal place to enjoy unforgettable days. It has a spacious, friendly and bright interior which recreates the warmth of the setting in bedrooms and common rooms, while the closeness of the sea can be felt from their windows.